Amish are well-known for living by guidelines and rules governing technology, dress, and other aspects of daily life. But Amish churches are not all the same. Some are more traditional, and others more progressive. Some do things one way, and others do things another way. So how do Amish know the dos and don’ts specific to their churches? This information is contained in the Ordnung. It’s a living “document” which is reviewed and affirmed by the community twice yearly at the Council service preceding Communion. 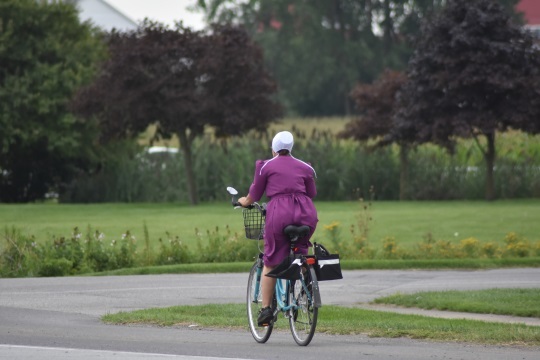 The Ordnung will vary, and sometimes drastically, reflecting differences across Amish society from the plainest to the most progressive churches. For example, some churches will prohibit indoor plumbing, linoleum flooring, and even riding in vehicles. In other Amish churches, interiors resemble non-Amish homes, and members use tractors as de facto vehicles. I put “document” in quotes above, as the Ordnung is typically unwritten (but not always). On the other hand, one example of a written Ordnung comes from Daviess County, Indiana. It’s referenced in The Amish Way for its detailed description of what materials buggies should be made of, and their overall design. Another example can be found in a recent article in the Bitterroot Star on the young Stevensville, Montana Amish community. This currently 10-family settlement was founded several years ago by Amish from the nearby St. Ignatius community, as well as from other states. The main source for the article is Marcus Hostetler, whose family was the first to move to the Stevensville area in 2015. Hostetler describes his church’s Ordnung document, which is called “Expression of faith and guidelines for the Stevensville Montana Church.” The article shares several points from the document concerning dress, technology and more. It turns out the Stevensville community is a pretty materially progressive church. Unlike most Amish, they allow electricity in the home. They also permit word processors without an internet connection, and basic cell phones if necessary for work. 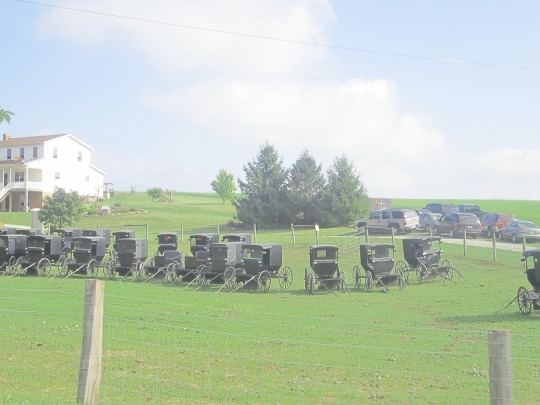 However they are still a plain-dressing, horse-and-buggy Amish group. The St. Ignatius community is a New Order Amish settlement, and I would presume that designation applies here as well. This sounds pretty standard for Amish churches. I think you do see sweatshirts and/or sweater type tops in some of the larger settlements so this point might be a bit more restrictive even (northern Indiana or Holmes County for instance). Also of note: demonstrating how the Ordnung can change, the community initially had more strict requirements for clothing worn in bridal parties, but now allows more colorful clothing. I don’t know how many other Amish Ordnungs would prohibit cowboy or ten-gallon style hats. Maybe that is an issue here, since this is the West, after all. I would suppose one of the main appeals of living in a Western Amish settlement in such beautiful and expansive natural environs would be the hunting and fishing, two activities favored by Amish across North America. Maybe given the splendid natural setting, it is a greater temptation in this part of the country. Bicycles are also permitted for “necessary travel.” No horse breed is stipulated though Standard Breed is the most preferred type, with some using Morgan or Dutch Harness. You might get away with not wearing a hat a few times or talked to about some bright red suspenders, but some infractions are very serious and cannot be tolerated at all, such as divorce. You can only marry once and it’s forever. If one’s spouse should leave the faith, the remaining spouse cannot re-marry. Smoking and drinking alcohol are also prohibited. It sounds like they’ll be building a church building here, which is the way things are done at St. Ignatius (another unusual aspect, as most Amish worship in the home or other pre-existing structures). One additional bit: If you happen to be in the area, this Friday, February 8th the community is holding a benefit fish fry dinner and auction to raise funds for the community school. It’s at St. Mary’s Family Center, 333 Charlos Street in Stevensville. Dinner starts at 5 p.m. and the auction is scheduled for 7 p.m. It’s an all-you-can-eat dinner of batter fried fish, scalloped potatoes, baked beans, coleslaw, homemade dinner rolls and pie and ice cream for dessert. There is no charge. Donations only. I like watching Amish Meadows on You Tube so, are they really Amish? I’m not familiar with Amish Meadows, is it connected with Meadowlark Log Homes? My question is, can women that are 30-45 years of age marry a widower that’s in his 60’s. I’m not looking for a younger wife. And I’m pretty sure my wife of 35 years would not approve, anyway. But, I’d also like some clarification. I read “you can only marry once, and it’s forever”. Does that also exclude 2nd marriages after the death of a spouse? No remarriage after the death of a spouse is permitted and is pretty common. You will sometimes come across huge blended families having 15+ children. Eric, No remarriage after death for male or female? Even if they had no children or were only married for a month or so? I left out a comma and can see my answer may have been confusing. I meant to answer Steve’s question “no, remarriage after the death of a spouse is permitted, and is pretty common.” For both male and female. About 8 years ago at Thanksgiving time our family drove to the area of Dalton, Wisconsin to visit Mischler’s Country Store. On the way I remember seeing a young male(dressed plain)riding an open wagon with 1 horse. On the way back I saw the same person standing on top of the wagon using a chain saw to cut branches from a tree. It’s interesting what modern equipment is allowed and what is not. I am thankfull for the Amish community in my area. Although I am often a target for hate as a person of African decent, they are always kind in their dealings with me. A time I remember in particular is when I needed help with my automobile which had stalled on the side of a rural road. Truthfully, I may have feared for my safety if it were an ‘English’. When a son joins the Amish: What about photos?